The #8660 single-component non-skinning butyl provides adhesion and a permanent seal where a non-hardening weather seal is desired. 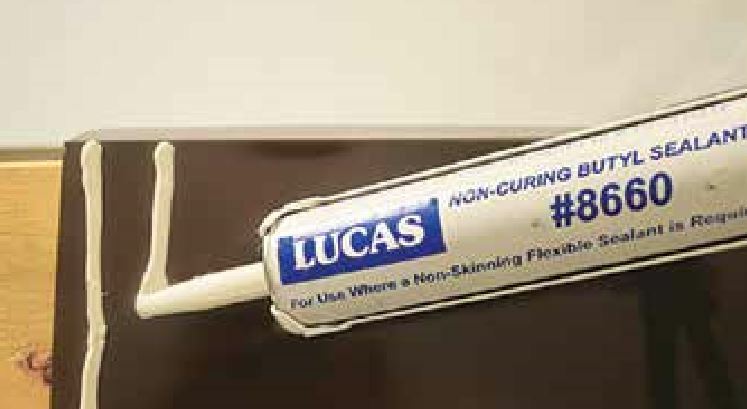 Lucas has added #8660 single-component non-skinning butyl to its product line. The #8660 provides adhesion and a permanent seal between concealed end-laps, metal roof panels, standing-seam roof panels, ridge cap, wall panels and other applications where a non-hardening weather seal is desired. This product is a suitable material for OEM and shop assembled metal details. The #8660 comes in a neutral color, guns easily in cold or hot weather, and is packaged 12 per case. Lucas #9500 Single-Ply Sealant is a one-component, non-shrink, advanced technology polyurethane sealant designed for the construction of liquid flashing systems and sealing pitch pockets and pans, metal roof seams and fasteners, inlaid gutters, polyurethane foam, PVC and EPDM roofs. Lucas #9500 Single-Ply Sealant is a one-component, non-shrink, advanced technology polyurethane sealant designed for the construction of liquid flashing systems and sealing pitch pockets and pans, metal roof seams and fasteners, inlaid gutters, polyurethane foam, PVC and EPDM roofs.The semi-self-leveling properties make it so that it can be used to seal seams and repair single-ply membranes at any slope. It may also be used on TPO roofs when primed with Lucas #8015. 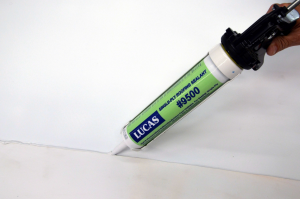 The Lucas #9500 is compatible with Lucas water-based acrylic coatings. It is suitable for repairing hail-damaged polyurethane foam roofs. It may also be used in conjunction with custom-manufactured Lucas PolyPans and metal pitch pockets. The #9500 comes in white and black colors, guns easily in cold or hot weather, and comes packaged 12 per case. Lucas has added two new package designs to the #4500 Semi-Self Leveling Joint Sealer. Lucas has added two new package designs to the #4500 Semi-Self Leveling Joint Sealer. Packaging now includes a 28-ounce plastic cartridge with a removable tip and a 2-liter re-sealable foil pouch. Both packages will reduce job-site waste, improve productivity and reduce landfill trash. #4500 is ideal for liquid flashing repairs, roof seams, inlaid gutters, repairing polyurethane roofs and filling pitch pans/pockets. Compatible with most acrylic based coating systems, BUR, EPDM, PVC, TPO, urethane foam and other roofing materials, #4500 is the ideal roof sealant.